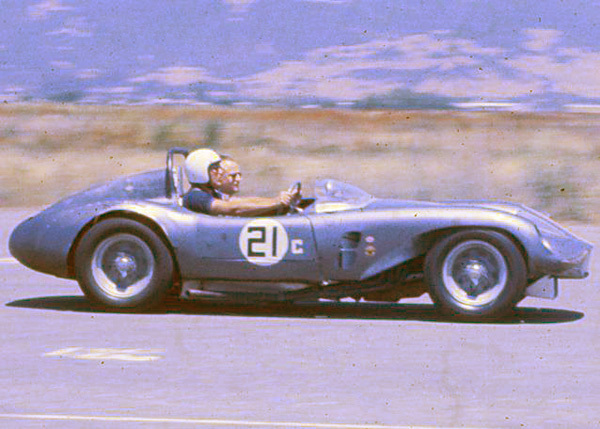 From Locke DeBretteville: "This car was built by an old friend of mine, Dave Selway. It was a Devin bodied, Chevy powered beast with Jag rear end and MG suspension. It was called the Chevway. It was recently fully restored in England, where it now races in vintage events. Dave is a fascinating guy who taught at Cal, from where he graduated, and worked at Lawrence Livermore Labs." Classic photo! 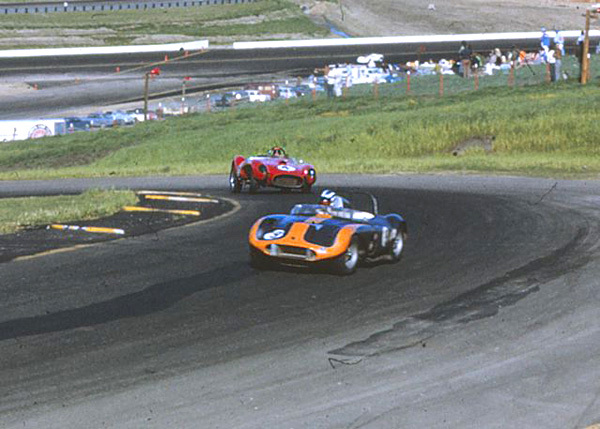 Selway in the Chevway leads David Love in his Ferrari Testa Rossa through Turn 2 at Sears Point (now Infineon) Raceway. This photo must have been shot at one of the very first Sears Point events. 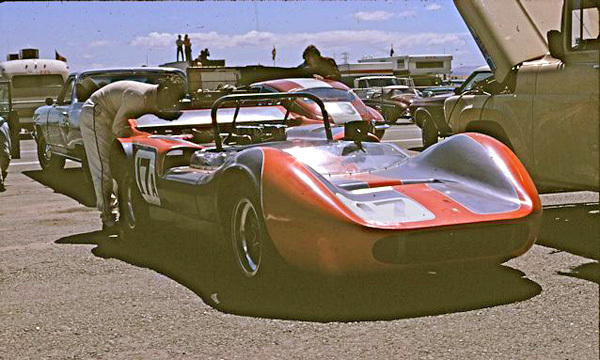 From Locke DeBretteville: "In 1970 Dave bought the Carl Haas Simoniz McLaren M1C that Chuck Parsons drove in the USRRC and Can-Am. We're trying to get it ready for Steve Earle's June race at Sears Point which features McLaren. The car hasn't run since 1970. Dave is doing most of the work because we're busy with our cars, but another old friend, Dan Marvin, will do the driving because Dave feels he is too old and he's only ever had the use of one eye. Dan, Jon Norman & I ran Alfas and FFs back in the day and are old friends. In fact there are a lot of us out of Berkeley who raced in the day and remain close. The interesting thing is that the genesis of what we call Punk Racing started with the friendship of a Cal teacher, Dave Selway, and a student he had back in 1960, Marnix Dillenius (he's run a TZ1 for a million years). That friendship spawned the big circle of friends that now exists---one of the few times you can trace a "tree" back to its roots, more or less. Normo and Dan went on to Formula Atlantic while I floundered and ran out of money running my FF. Dan is clearly the best amongst us, so he gets the duty with the McLaren. Mark Blaze is another "Punk" who works in hi-tech now, but he's an incredible fabricator who was the head mechanic on Danny Ongais' F5000 Lola T400 & T332 under Carroll Smith. In fact Ongais wrote off 2 or 3 cars, all of which required Mark to build up a new car before the next race---tough work. Mark also worked for Phil Remington, point being he knows his stuff. Dave ran the car with both the M1C body and an M6 body, but it's now back to M1C guise." 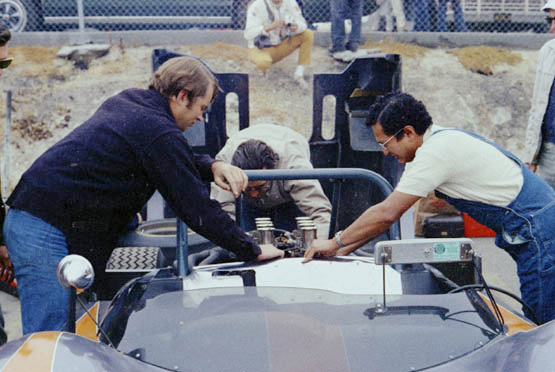 More from Locke DeBretteville: "Above is the M1C with (L-R) Ivan Zaremba, Fred Jessen, and Marnix wrenching on it at the 1970 Laguna Can-Am." To comment or add to this page: Please email me! Back to: Doug Hooper's "Alligator Special"